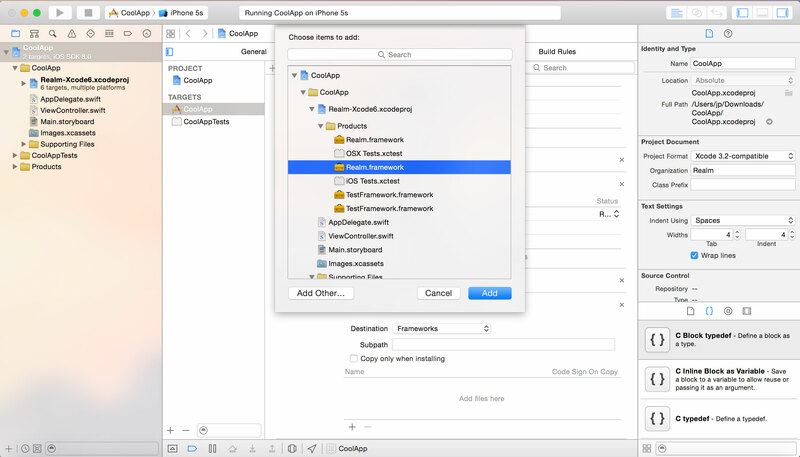 Drag Realm.framework from the ios/ or osx/ directories and into the Frameworks folder in your project in Xcode. Make sure Copy items into destination group’s folder is selected and press Finish. Click on the project in the Xcode file explorer. Select your target and go to the Build Phases tab. Under Link Binary with Libraries press + and add libc++.dylib. Set “Defines Module” to YES. 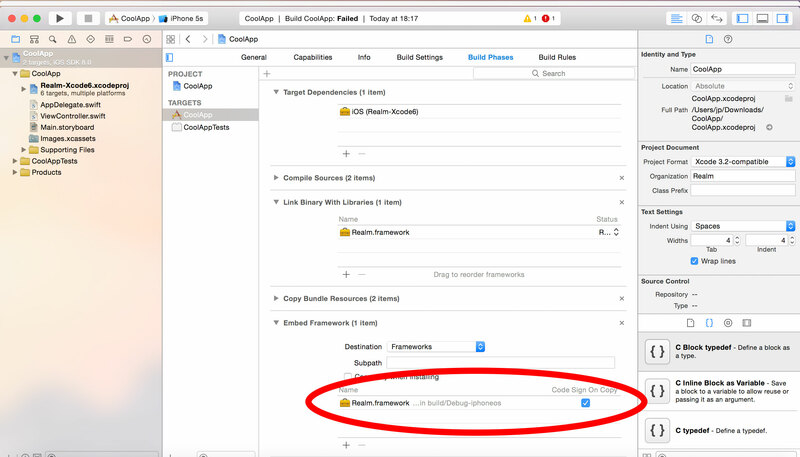 If you have installed Xcode 6 beta or are running Yosemite, you may get an “unidentified developer” error when launching the app due to a bug in Apple’s beta releases. 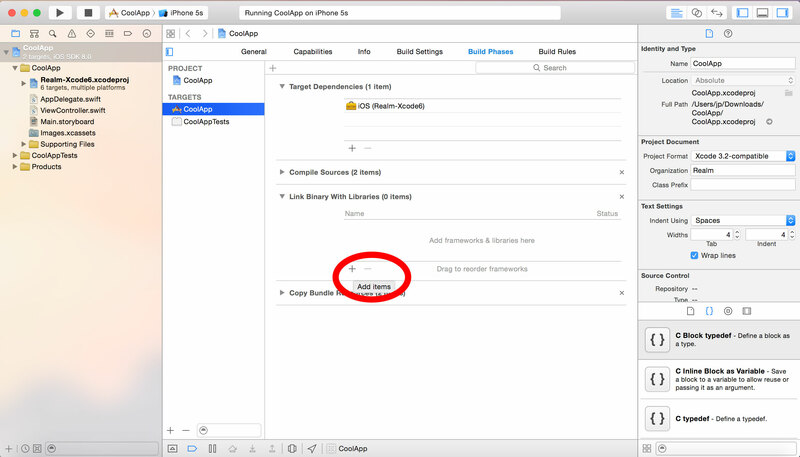 You can find example Objective‑C applications in our release zip under ios/examples/, demonstrating how to use many features of Realm like migrations, use in UITableViewController’s, encryption and much more. Realm data models are defined using traditional NSObject-style classes with @properties. Simply subclass RLMObject to create your Realm data model objects. Realm model objects mostly function like any other Objective‑C objects - you can add your own methods and protocols to them and use them like you would any other object. The only restrictions are that you can only use an object on the thread which they were created, and you can’t access the ivars directly for any persisted properties. Relationships and nested data structures are modeled simply by including properties of the target type or RLMArray’s for typed lists of objects. Realm supports the following property types: BOOL, bool, int, NSInteger, long, float, double, CGFloat, NSString, NSDate, and NSData. Moreover, subclasses of RLMObject and RLMArray<x> are supported to model relationships. Note that Realm ignores Objective‑C property attributes like nonatomic, atomic, strong, copy, weak, etc. This is done because Realm has its own optimized storage semantics under the hood. So to avoid being misleading, we recommend writing models without any property attributes at all. However, if you do set property attributes, they will be used until an RLMObject is added to a realm. Custom names for getters and setters work normally regardless of whether or not an RLMObject is in a realm. All changes to an object (addition, edition and deletion) have to be done through write transactions. After you have added the object to the Realm you can continue using it, and all changes you make to it from now on will be persisted and available from other threads that uses the same realm. Please note that thanks to Realm’s MVCC architecture, reads are not blocked while a write transaction is open! This means that unless you need to make simultaneous writes from many threads at once, you should favor larger write transactions that do more work over many fine-grained write transactions. A note about using Realm Arrays (RLMArray): All successful calls to retrieval and querying methods return the resulting collection of RLMObjects in an RLMArray. RLMArrays can be manipulated similarly to a standard NSArray; however, RLMArrays are typed, meaning they only hold RLMObjects of the same RLMObject subclass type. For more details see RLMArray. The most basic method for retrieving objects from a Realm is [RLMObject allObjects], which returns all RLMObject instances of the same subclass type from the default Realm. If you’re familiar with NSPredicate, then you already know how to query in Realm. RLMObjects, RLMRealm and RLMArray all provide methods that allow you to query for specific RLMObjects instances by simply passing in an NSPredicate instance, predicate string, or predicate format string just as you would with an NSObject instance. In many cases it is desirable to be able to have a retrieval or query operation return an ordered result set. To enable this, RLMArray supports method that allow you to specify a property name to order the result set by. For more, see [RLMObject objectsWhere:] and [RLMArray arraySortedByProperty:ascending:]. Another advantage of Realm’s use of regular objects to store your application data is the ability to chain queries with very little transactional overhead, compared to traditional databases that require a separate trip to the database server for each successive query. You may have noticed so far that we have always initialized access to our realm variable by calling [RLMRealm defaultRealm]. That method returns an RLMRealm object that maps to a file called “default.realm” under the Documents folder of your app. Write transactions will be automatically written to disk at that location for you, and likewise for reads. It’s sometimes useful to have multiple realms, persisted at different locations, for example if you have different data groupings, different databases per feature, or you need to package some read-only files with your app, separate from the database your users will be editing. See [RLMRealm realmWithPath:] and [RLMRealm realmWithPath:readOnly:error:] for more info. If you want to access the same realm file from different threads, you must call [RLMRealm defaultRealm], [RLMRealm realmWithPath:] or [RLMRealm realmWithPath:readOnly:error:] to get a different Realm object for every thread of your app. As long as you specify the same path, all RLMRealm objects will map to the same file on disk. Do not share RLMRealm objects across threads. The Default Realm is persisted to disk by default, but you can also use it purely in memory by calling the following line before any call to [RLMRealm defaultRealm]. RLMRealm *realm = [RLMRealm defaultRealm]; // Only call this line after! This option is only available on the default Realm. If you use your default Realm in memory, it will not persist your RLMObjects, meaning data will not be saved across app launches. However, all other features of Realm will work as expected, including querying, relationships and thread-safety. This is a useful option if you need flexible data access without the overhead of disk persistence. Notice: When the in-memory Realm goes out of scope with no references to it, all data is freed. We are considering improving the API and semantics to make this feature more intuitive. When you do queries, children will not be fetched into memory at query time, but you will be able to navigate the links automatically without having to manually fetch children, i.e. doing calls such as rex.owner.address.country will automatically traverse the object graph for you to return the objects needed. You can establish a relationship to several objects from a single object via an RLMArray<Object> property declaration. RLMArrays are basically containers of RLMObjects, that behave very much like an NSArray, with the notable exception that they are typed. Note: RLMArray properties on models are “copy on write”. Any direct assignment of that property will copy the references to the objects from the assignee into the assigned property. In the example above, that means that any dogs added to some_dogs after jim.dogs = some_dogs; would not also be added to jim.dogs. You can use the token to unsubscribe from the notification later on. We recommend you store this token on your Main class, as losing reference to it will automatically unsubscribe you from the notification. // Add row via dictionary. Order is ignored. Retrieve large amounts of data with a single API call or by pre-fetching in the background, then persist it in the Realm. Since Realm is thread-safe, you can easily asynchronize this task and update your views once the REST call has completed. Query data directly from the Realm, rather than waiting for the API to process complex queries server side. Offer a strong user experience while offline since you can cache large datasets that you can still query and update. Reduce server-side load: while the first few interactions may generate more traffic than usual, having a cache dataset can help reduce server-side load over time by reducing the frequency at which have to fetch the same data over and over. Asynchronous Requests — Since Realm can hold a large amount of data in a small footprint, a good practice is to execute multiple API requests in the background to build a larger local data set. This creates a more seamless user experience in your app, as the user never experiences wait time for an API request to return on the main thread. You can use Notifications to monitor the progress of your REST requests. Caching datasets larger than what will be immediately displayed to the user — We recommend you pre-fetch data as often as possible and store it locally in your Realms. For example, if you are only displaying 10 results per page in a List View, fetch the next 3-4 pages of results if the user is likely to visit them. You should consider doing the same with map view (fetch results for the surrounding areas) or for your app in general (pre-fetch data for screens the user is likely to browse to during the normal course of his usage). Insert-or-update — If your dataset has a unique identifier such as a primary key (or set of unicity conditions), you can use it to easily code insert-or-update logic: when receiving a response from the API, you can check if each record already exists by querying the Realm for it. If it does exist locally, update with the latest details from the response, if not, insert it into the Realm. Just changing your code to the new definition will work fine, if you have no data stored on disk under the old schema. But if you do, there will be a mismatch between what Realm sees defined in code, and the data Realm sees on disk. In short if you change your schema definition in one of your models and then instantiate a realm with [RLMRealm defaultRealm] (or a similar realm instantiation call), that call will throw an NSException with a message that you should run a migration. Realms that contain at least one class that has been redefined must be migrated to the current schema before they can be accessed. To make this process easy, Realm provides specialized classes and methods for handling schema migration. You define a migration by implementing an RLMMigrationBlock which you pass into a call to [RLMRealm migrateDefaultRealmWithBlock:] for the default Realm or [RLMRealm migrateRealmAtPath:withBlock:] for other Realm instances. Your migration block provides all the logic for converting data models from previous schemas to the new schema. At the very minimum, all we need to do is return 1; to indicate the that the schema has been upgraded (automatically) by Realm. N.B. The version number returned can be either an integer (version) or timestamp (epoch). 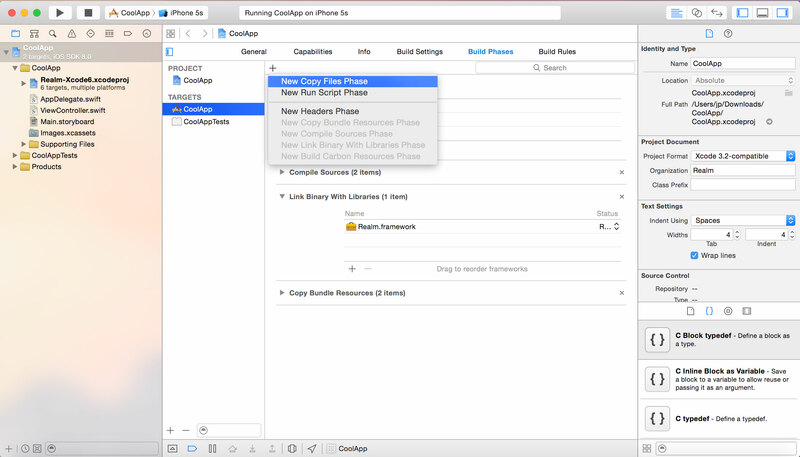 We recommend you set it manually in the code as it defines the current version of the schema your app is using. While you must manually return the version number to the app at the end of your migration block, note that Realm takes care of updating the schema version number inside the realm on disk. Suppose we have two users for our app: JP and Tim. JP updates the app very often, but Tim happens to skip a few versions between sessions in. It’s likely that JP has seen every new version of our app, and every schema upgrade in sequence: he downloaded a version of the app that took him from v0 to v1, another update that took him from v1 to v2. In contrast, it’s possible that Tim will download an update of the app that would need to take him from v0 to v2 immediately. Structuring your migration blocks with non-nested if (oldSchemaVersion < X) calls ensures that they will see all necessary upgrades, no matter which schema version they start from. 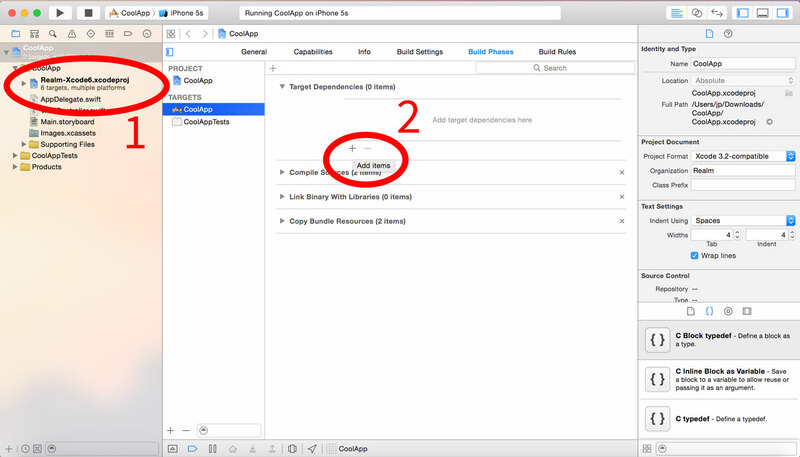 Another scenario may arise in the case of users who skipped versions of your app. If you delete a property “say address” at version 2 and re-introduce it at version 3, and a user jumps from version 1 to version 3, Realm will not be able to automatically detect the deletion of the “address” property, as there will be no mismatch between the schema on disk and the schema in the code for that property. This will lead to Tim’s Person object having a v3 address property that has the contents of the v1 address property. This may not be a problem, unless you changed the internal storage representation of that property between v1 and v3 (say, went from an ISO address representation to a custom one). To avoid this, we recommend you nil out or the address property on the if (oldSchemaVersion < 3) statement, guaranteeing that all realms upgraded to version 3 will have a correct dataset. Once your app is built for release, Realm should only add around 1MB to its size. 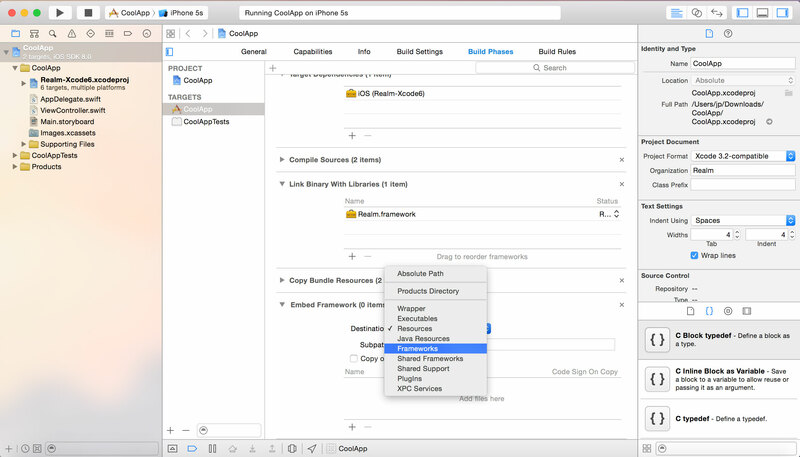 The releases we distribute are significantly larger (around 30MB for each .Framework) because they include support for more architectures (ARM, ARM64, x86 for the simulator) and some debug symbols, which will all be stripped by Xcode automatically when you build your app. Can I use Realm for OS X? Yes! 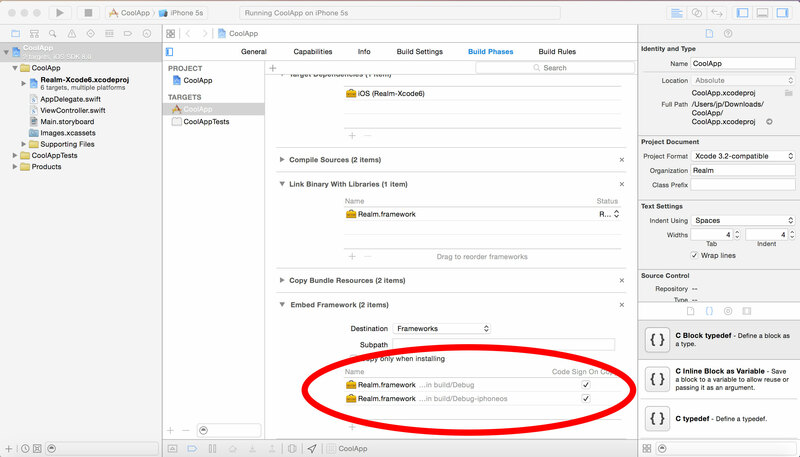 At the moment you just need to build from source, which will create a separate, OS X compatible .Framework you can use in your apps. We are working on adding it to our CocoaPod as well. You should expect our Objective‑C APIs to break as we evolve the product from community feedback — and you should expect more features & bugfixes to come along as well. The Swift API should only be used in production after Swift has been stabilized by Apple itself; right now our API is experimental due to the fact Apple is continuously changing the language with every new beta release. No, Realm for iOS is entirely free to use, even in commercial projects.